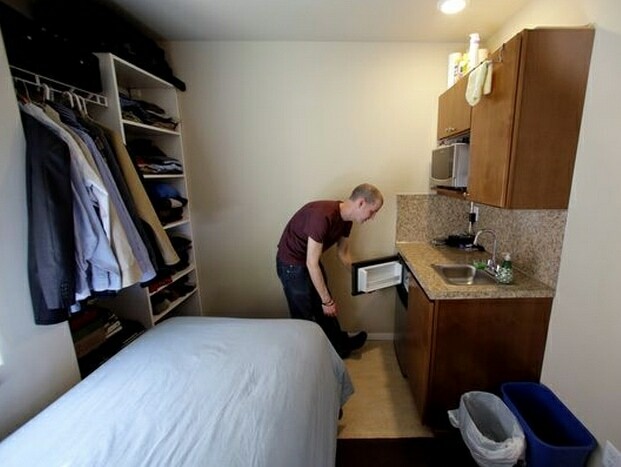 Can you live in a 'micro apartment'? If you are familiar with Singapore’s property market, the term “shoebox apartments“, often known as “micky mouse” units shouldn’t be foreign to you. They are residential properties which are usually smaller than 500-sqft in size. If you think that’s non-livable, you probably want to take a look at this latest trend of a new property type in Hongkong called “micro-flat” or “micro apartment“, which is not more than 180 sqft in size. For this particular new launch development called Mont Vert, because of it’s eye-watering price tag of HK$1.5 million (approximately S$262,000) which strongly appeals to the young middle-class, it has got these property buyers queuing up to make their purchases. As reported, it’s a typical mentality in Hongkong where people yearn to own a place of their own. However due to the overheated property market in Hongkong, many have been priced out. Thus, they are now looking at more affordable options and purchasing a studio apartment or flat is probably the first step to home ownership in Hongkong. What’s even more astonishing (something you’ll probably not see in Singapore’s property market), even though the development has yet to be completed, these potential buyers are making their purchases despite there aren’t any show flats, pictures or the units or models. A video report from CNBC on the demand for smaller homes in HongkongApparently in Hongkong, the larger the home, the pricier it gets. It’s certainly a similar situation being experienced in Singapore’s property market. Thus potential home buyers such as young professionals and newly-wed couples in Hongkong who are seeking independence from living with their parents, will likely have go for smaller apartments like what Mont Vert has offered. Thankfully in Singapore, we still have HDB flats to choose from.